Real Madrid president Florentino Perez has reportedly got a trick up his sleeve in terms of sealing the Eden Hazard transfer from Chelsea – possibly as early as this January. According to Don Balon, Perez hopes to offer on-loan midfielder Mateo Kovacic to Chelsea on a permanent deal along with some cash for Hazard. The Spanish outlet claims Chelsea owner Roman Abramovich is keen to keep Kovacic beyond his loan spell, and Perez plans to use this to his advantage regarding Hazard. 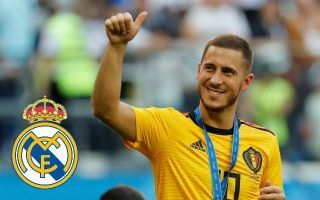 The Belgium international was linked with Real Madrid for much of the summer, but a deal now looks highly unlikely as Chelsea cannot sign a replacement until the English transfer window opens again in January. CFC would be mad to let the 27-year-old leave without the option of replacing him for half the season, but Don Balon suggest Real believe they could get him in January. Barcelona played a similar waiting game when signing Philippe Coutinho from Liverpool last season, with the club finally landing him in the middle of the campaign. Unlike Coutinho, Hazard would also not be cup-tied for the Champions League for the second half of this season as Chelsea are only in the Europa League this year, which Don Balon report wouldn’t affect his participation in Europe’s other main club competition, as per new rules. Eden Hazard to Real Madrid - is it still on this summer?